Comprehensive, relevant, and meticulously up-to-date, BUSINESS LAW, Eleventh Edition, combines in-depth coverage of business law in a unique student-friendly format. It delivers a classic blend of black letter law and cutting-edge coverage of contemporary issues and cases - making the law accessible, interesting, and relevant for readers. It provides an excellent assortment of cases, ranging from precedent-setting landmarks to the most recent decisions. Ethical, global, and e-commerce themes are integrated throughout the text, which also emphasizes critical-thinking skills. Numerous features and exercises ensure that students have a solid understanding of chapter concepts. In addition, the text's unmatched support materials include innovative online study tools (available on the text's companion web site: www.cengage.com/blaw/clarkson) that will help maximize efforts and improve results. 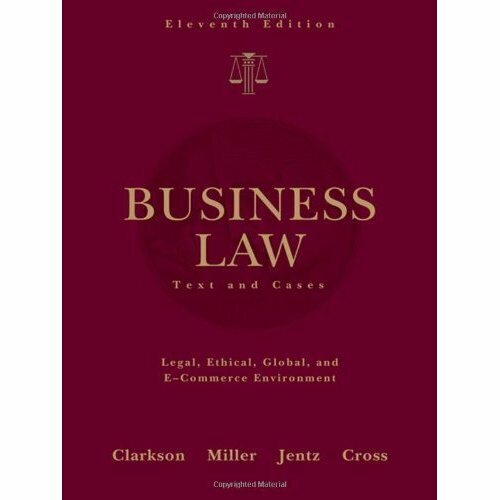 It's no wonder that BUSINESS LAW, Eleventh Edition, is used by more colleges and universities than any other business law text.